The government shutdown has come to an end and the debt ceiling has been raised after Congress passed the deal worked out between Senate Majority Leader Harry Reid (D-NV) and Minority Leader Mitch McConnell (R-KY). The final deal is funds the federal government through January 15 and raises the debt ceiling to February 7. It also allows for budget negotiations between the two chambers, with the goal of coming to an agreement by December 13. Those points were sort of the basic parts of the deal. Other aspects of the deal include, according to Jamie Dupree, back-pay for furloughed federal workers, reporting requirements on verification procedures for ObamaCare subsidies, and blocks a pay raise for Congress in FY 2014. House GOP to bring back earmarks? After taking control of the House of Representatives in a wave election in 2010, House Republicans decided to extend their moratorium on earmarks, a controversial budget tactic that allow members to insert pet projects in spending bills without so much as a committee hearing or vote. The huge federal transportation bill was in tatters in early March when Representative Mike Rogers of Alabama posed a heretical idea for breaking through gridlock in the House. In a closed-door meeting with fellow Republicans, Rogers recommended reviving a proven legislative sweetener that became politically toxic a year ago. Bring back earmarks, Rogers, who was first elected to Congress in 2002, told his colleagues. Few members of Congress have been bold enough to use the “e” word since both the House and Senate temporarily banned the practice last year after public outcries about Alaska’s “Bridge to Nowhere” and other pork barrel projects. But as lawmakers wrestle with legislative paralysis, there are signs that earmarks - special interest projects that used to be tacked onto major bills - could make a comeback. The practice of earmarks has come under scrutiny in recent years and some members in both chambers have pushed for bans on the practice because of the propensity of their colleagues to use them for less than noble purposes. The House of Representatives did enact a moratorium, though it doesn’t seem to be all that effective. Some say that restricting earmarks is unconstitutional because it cuts in on congressional spending authority in Article I, Section 8. Others say that earmarks represent a fraction of the budget and eliminating them does nothing in the way of restoring fiscal responsibility. The former has some merit, but we know how James Madison, the Father of the Constitution, felt about spending for pork projects. It’s hard to see that he would find funding peanut research meets any constitutional litmus test. The latter is true; however, earmarks are the epitome of what is wrong with Washington, DC. Yes, reforming entitlements and cutting spend elsewhere is incredibly important, but earmarks are a symbolic part of the battle. If we can’t cut this fraction of spending out of the budget or reform the earmark process, are we naive enough to believe that we can reform entitlements? Back in 2006, at the height of the discussion about ethics in Congress, Rep. Jeff Flake (R-AZ) explained that earmarks are the “currency of corrpution.” Not only were members using them to steer business to donors and friends, they were being used by leadership of both parties to sway votes on legislation. Gary Johnson or Ron Paul? On Thursday, former New Mexico governor Gary Johnson announced his candidacy for President of the United States. Texas Congressman Ron Paul is expected to announce his candidacy at some point in the future. That would put two libertarians campaigning for the limited libertarian vote in the GOP. Some argue that this would be a good thing, that the two could shred the likes of Donald Trump and Sarah Palin in the primary debates. Unfortunately, let’s face facts. Paul didn’t perform well last time in the debates, so the only reason to expect different this time is the pathetic line up we’re looking at from the GOP this time around. However, as things stand at the moment, I’m putting my weight behind Gary Johnson. This isn’t a lack of respect or admiration for Ron Paul, those are as strong as ever. However, Johnson has a few things going for him that Paul doesn’t necessarily. It’s true that both have a record to stand on. However, Paul as repeatedly used earmarks to send money to his home district. Granted, he always votes against the budget after adding those earmarks, but some can easily argue that Paul knows it will pass anyways so he’s just voting against the budget on form. He’s bringing home the pork just like so many he criticizes, at least in their eyes. Johnson, on the other hand, vetoed over 750 pieces of legislation during his time as governor of New Mexico. If you were looking for a substantive discussion of the problems facing the United States, last night’s State of the Union address was a let down. President Barack Obama spent 62 minutes speaking in mostly generalities and explaining to us how great government spending is, but also warning the Congress that he will veto bills containing earmarks – special projects that are inserted into legislation that go bypass the normal budget process. President Obama also pledged to take measures to cut spending by enacting a five-year freeze on non-defense discretionary spending. While he may consider this to be some great feat, Obama’s proposal will only save $400 billion during that time. This is a drop in the bucket compared to the $6 trillion in budget deficits projected by the Congressional Budget Office. Doug Mataconis, Brett Bittner, Mike Hassinger, Tom Knighton and Jason Pye will be live-blogging President Barack Obama’s State of the Union address and the Republican response given by Rep. Paul Ryan (R-WI). We’ll kick things off around 8:30pm (EST). Our friends at the Cato Institute are also live-blogging this evening. You can full text of President Obama’s prepared speech here. Excerpts from Rep. Ryan’s speech are available here. Dr. Paul explains the truth behind earmarks and the responsibility Congress has to earmark every single dollar. 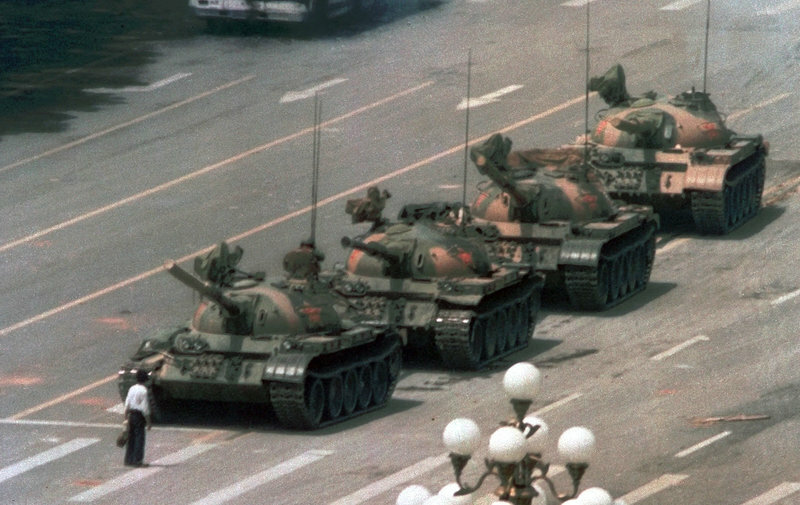 — Remember the Unknown Rebel: Twenty-five years ago today, an unidentified man, thought to be a student, walked in front of a line of tanks on their way to Beijing’s Tiananmen Square, where thousands of students, yearning for freedom, were protesting China’s totalitarian government. 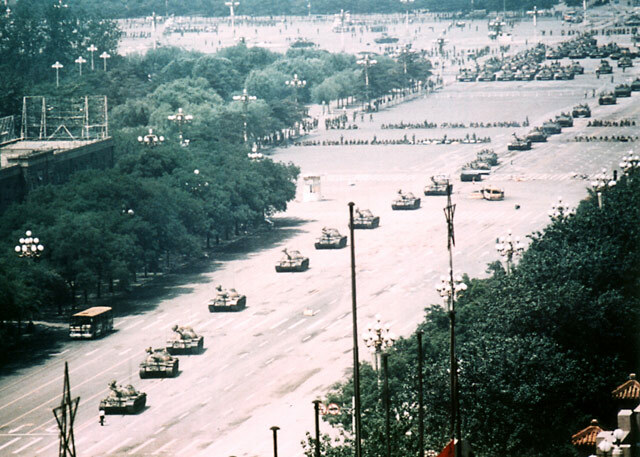 The day before the photo above was taken, the military had stormed Tiananmen Square, killing as many as 1,000 protesters. The famous photo of “tank man” is censored in China, but his stand against an oppressive government is an inspiration to millions. But to show what exactly this brave guy was up against, see below. — Glenn Greenwald blasts Hillary Clinton: The journalist behind the NSA whistleblower Edward Snowden’s disclosures didn’t hold back in his criticism of Hillary Clinton, the likely Democratic presidential frontrunner. “Hillary is banal, corrupted, drained of vibrancy and passion. I mean, she’s been around forever, the Clinton circle,” Greenwald said in an interview with GQ. “She’s a f**king hawk and like a neocon, practically. She’s surrounded by all these sleazy money types who are just corrupting everything everywhere.” Gospel.